Cloud backup is all the rage these days for three great reasons: it’s easy, it’s secure and it’s inexpensive—and Zip Cloud exemplifies these fundamental aspects of online storage. But Zip Cloud doesn’t stop at merely providing customers with the means to back up their computer; they also provide an abundance of user-friendly features that make it easy to access previously backed up files using a PC, laptop, tablet or smartphone. Zip Cloud offers three distinct plans to consumers; the Home Plan, the Premium Plan and the Unlimited Plan. No matter which plan you opt for, the same high-level security, ease of accessibility and backup automation ensures that all of your data is safe and secure. Zip Cloud’s automated backups provide a convenient, hands-free data protection strategy that safeguards the security and accessibility of your documents, music, photos, videos and more. Simply install the desktop application and create a backup schedule that will run in the background without having to do anything extra. You can also use the handy drag-and-drop feature to manually backup files and folders to the cloud, after which you can sync those files to other computers to access your data from multiple devices, including your smartphone. As data security threats become more commonplace, it’s comforting to know that Zip Cloud uses top notch security technology to ensure the privacy of your documents, photos, videos and other data. The transmission of data to and from the cloud is a critical point in the backup process which is why Zip Cloud uses a 256-bit Advanced Encryption Standard (AES). AES is an encryption method that takes the electronic data being transmitted over the Internet and protects it from would-be hackers. Zip Cloud utilizes Google’s Cloud Storage servers, which are located in multiple data centers around the world to safely replicate your data and make it accessible to you at anytime, anywhere. Zip Cloud offers 24/7 email support 365 days a year to provide technical help, billing assistance or any other inquiries regarding accounts. 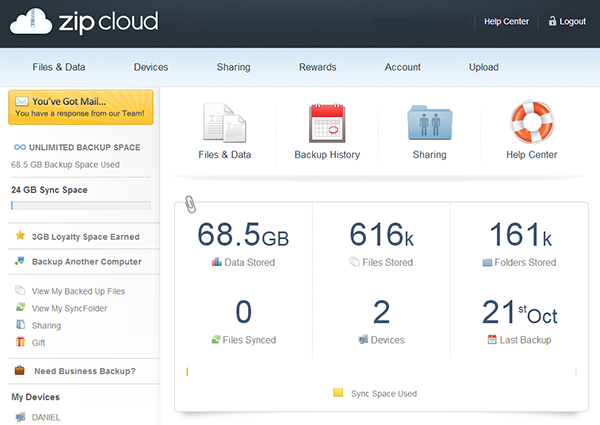 In addition, Zip Cloud provides a very robust FAQ section that will likely answer any question that might arise. Topics are conveniently organized based on the most common tasks and issues, and are explained thoroughly in easy to understand terms. Zip Cloud gives you another helpful option to seek out the answers to questions by joining their online community. Follow them on Twitter (@zipcloudhelp) or ‘Like’ them on Facebook to stay connected to others who use Zip Cloud and can offer additional insight and assistance if needed. As access to our data expands, so should our productivity. Sometimes we find ourselves on the road and wanting to hear that one song or album, but don’t currently have it on our phones. Zip Cloud offers a solution to access all of your data using virtually any device with an Internet connection, so you can download those tunes or that important presentation to your tablet, laptop or smartphone on the go. There are many scenarios you may find yourself in where you need to give file or folder access to another person or group of people. Zip Cloud allows you to add people to a list of shared files and folders that are always protected and always accessible. You can send email, Facebook or Twitter invitations through Zip Cloud that give your recipient the permission they need to access those documents, photos, videos and more. File versioning allows you to revert back up to seven days to locate the exact iteration of a specific file. Ability to transfer a license to another computer. Licenses are not required to backup up mobile devices such as iPhones, iPads and Androids. Zip Cloud offers plans that vary in price, depending on how much space is required. The following prices are based on their two-year plans. If you’ve never experienced the tedious task of backing up your computer to multiple CDs or DVDs, consider yourself lucky. Rotating media in and out of your computer required you to be present in order to replace filled media with blank media. Storing that media in a safe place was another grave concern and then organizing and sifting through a plethora of disks added to the headache. Thankfully, Zip Cloud exists to relieve us of the hardships of traditional backups by providing a seamless, intuitive backup solution that doesn’t require you to be present in order to protect your computer. Furthermore, you can access your files from anywhere and share them with anyone—a handy perk that will likely prove invaluable time and time again. As such, Zip Cloud is an easy choice for your online storage needs due to their commitment to making data backup secure, convenient and inexpensive.